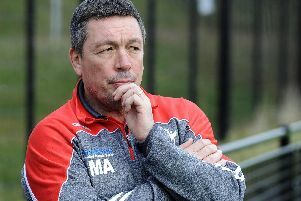 Sheffield Eagles director of rugby Mark Aston is still striving to find the solution to his side’s baffling lack of consistency. Friday’s defeat against Oldham was another frustrating dip in form, after what looked to be a season changing performance in the victory over Featherstone in the previous encounter. The season has been littered with examples of encouragement, most notably in the victory over Bradford Bulls, followed with a defeat, against Oldham. Aston has vowed to find a solution to the unpredictable nature of their performances, ahead of Sunday’s trip to London Broncos. There was no doubt that the defeat to Oldham was a hammer blow in the Eagles’ fight to maintain their Championship status. Eagles only have three regular season games remaining, two of which are against the division’s top two sides with London first on the menu this weekend. Whilst the Eagles have shown their capabilities against the likes of Bradford and Featherstone, they have been outplayed by London in both encounters already this season. Despite the tough nature of the fixtures ahead, Aston isn’t panicking knowing that the league split at the end of the regular season will give his side added time to get themselves out of what is fast becoming one of the most difficult seasons in recent memory. “It is very frustrating for all those concerned,” he added. Eagles travel to Andrew Henderson’s London this Sunday, kick off at the Trailfinders Sports Club is 3pm.